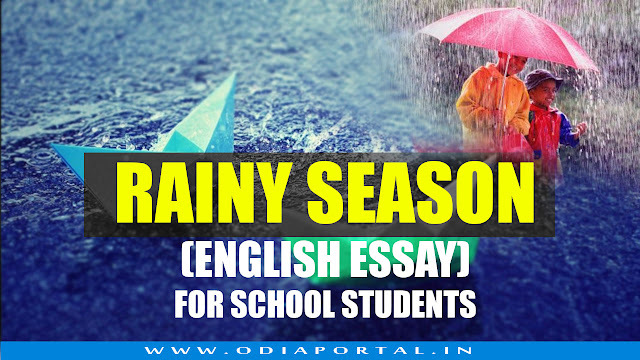 The Rainy Season is one of the six seasons in India. comes after Summer Season. It begins in July and ends in October. During the hot months water from the Indian Ocean goes up as vapors. These vapors make the clouds. When monsoon blows, it carries them to India. There clouds fall as rain and cause the rainy season. Clouds come in friction with One another, Thus, the thunder and lightnings are caused. The Rainy Season does a lot of good to us. It removes the heat of summer. It provides water to men and animals, it helps the Crops and vegetables to grow. Grass grows in plenty. Hence, Cows get a lot of grass to graze. People get a lot of milk from their milch Cows. In the Rainy Season, flood Comes in rivers. It puts-alluvium on the land. So, the land becomes fertile, Flood washes away the filth and rubbish from the village areas. When the flood subsides people grow new Crops and vegetables. In the Rainy Season, the earth becomes Cool and happy. The waterways are full to the brim. They help the inland trade. In the Rainy Season, the earth Wears a green Colour, Trees and Creepers are filled with new leaves, Flowers appear On them. The beautiful rainbow falls in the sky. The sun plays hide-and-seek with the clouds. The sun shines through theበበ and the gray clouds get multicolored. The boatmen ply their boats across the river. Peacocks dance in the woodland. Their beautiful tails spread like fans behind them. During the Rainy Season, people face a lot of difficulties. Paths become muddy and slippery. During heavy rain communications are cut off. Some hamlets on the low land get water locked, People cannot go to work. Day labourers cannot earn their bread. Students cannot go to School. Cattle Cannot go to graze. Shop-keepers cannot get a purchaser. Excessive rain knocks down the Country houses. People die of thunder-stroke and Snake-bite. Children suffer from Cough and Cold. Stomach troubles are very common in this season. Cholera breaks out in many places and carries off heavy toll Of life. Rain bring flood in rivers. Flood breaks the embankments and Sweeps away village after village. A lot of men and Cattle are drowned. Flood Carries Sand to the Corn-fields and turns them barren. Some Hindu festivals fall in this Season, Such as the Car-festival, Dewali and Durga Puja. Dewali is the festival of light. The Rainy Season is the Season of Crops and vegetables. It is the friend of farmers. It is the friend of trees and animals. It is the maker of food and giver of Wales. Hence, we revere and Welcome this Season.